You will find that the unique Southern African country of Namibia has many vacation options to offer even the most seasoned travelers. Namibia is an arid, sparsely populated country wedged between the Kalahari Desert and the South Atlantic. It offers a striking diversity of cultures and national origins, and a great number of wildlife reserves to choose from. The country is a photographer's dream - it boasts wild seascapes, rugged mountains, lonely deserts, stunning wildlife, colonial-style cities and nearly unlimited elbow room. Namibia's top destinations include Sossusvlei, a unique desert landscape in the southwestern part of the country, as well as the Etosha National Park in the far north. Both of these destinations offer endless horizons and a sense of spiritual bliss. More species can be seen congregated around the same waterholes than anywhere else in Africa. Massive red dunes, unique geological features and amazing stargazing are on offer at Sossusvlei. Though not quite as noteworthy as the destinations listed above, the vast land of Namibia holds many treasures. From Kaokoland and its desert elephants to the mighty Fish River Canyon and the quaint seaside town of Swakopmund, visitors will be spoiled for choice. The Caprivi is the most far-flung of the Namibia safari destinations visited by African Sky. This unique pocket of wilderness occurs where four rivers - the Kwando, Chobe, Linyanti and Zambezi - meet. The lush oasis draws a wealth of wildlife and hosts a handful of beautifully located lodges. 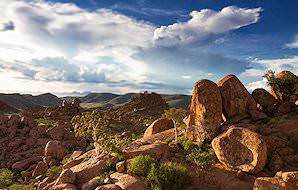 Damaraland covers 16 000 hectares southwest of Etosha National Park. This ancient region includes popular tourist sites like Twyfelfontein, with its ancient rock engravings, and the Brandberg Massif, Namibia's highest mountain. 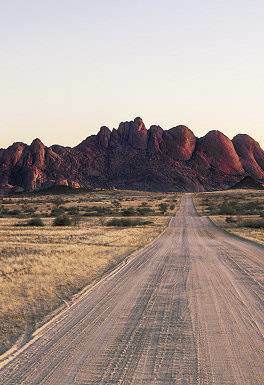 Damaraland is also home to the Damara tribe, Namibia's oldest inhabitants. The Skeleton Coast is a barren stretch of coast located where the icy waters of the Atlantic Ocean meet the harsh desert conditions of the Namib. Many shipwrecks line its inhospitable shores. 16 000 square kilometers are protected as a national park, and include a striking smattering of wildlife. Swakopmund is Namibia's premier seaside resort. The town's German character and architecture create a warm and inviting atmosphere. A great number of land- and ocean-based adventures and day trips are available from Swakopmund. There are also a number of fine beaches, though it should be pointed out that the water temperature will definitely take your breath away. 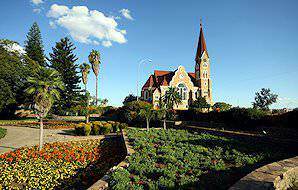 Windhoek is Namibia's capital city and the gateway to all the safari areas in the country. Many visitors overnight here en route. Much of the country's German colonial history is still prevalent in the city's architecture and overall atmosphere. Notable landmarks include the three castles and the old Lutheran church. 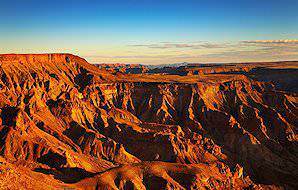 The Fish River Canyon is located in the far southern part of Namibia. It is the world's second largest canyon after the Grand Canyon in North America. It is 161 km long, over half a kilometer deep and stretches for 27km at its widest point. A natural spectacle that is quite inspiring. 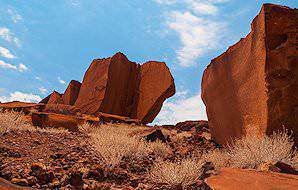 Twyfelfontein is a UNESCO World Heritage Site located in the Kunene region of northern Namibia. The area has been occupied for a period exceeding 6 000 years and has over 2 500 unique rock engravings that bear testament to the various groups of people who inhabited the region over the millennia. Kaokoland is one of the last true wildernesses in Africa, a harsh land of beautiful mountain scenery that is home to the rare desert-dwelling elephant, black rhino and giraffe. This vast land has a very low population density with only about 16 000 inhabitants of which most belong to the Himba Tribe. Kaokoland is the ideal destination for those who wish to get away from it all. Bushmanland is a remote area to the east of Etosha. It forms part of the Kalahari desert. The primary reason for visiting this isolated region is firstly to get into contact with some of the last hunter gatherers who still live close to the land. The second would be to experience the wildlife in this remote corner of Africa. The most notable national park found in the area is Kaudum, where Namibia's largest wild dog population is protected. 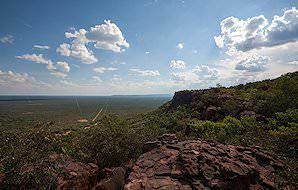 Located in central Namibia, the Waterberg Plateau Park was established in 1972 to protect the mountainous landscape that sits high above the Kalahari in the eastern part of Namibia. The park has been instrumental in the protection of Namibia's endangered species. Successful breeding programs for the black rhino made it possible to reintroduce black rhino from this park to Damaraland, where they had become locally extinct. Namibia vacations offer great value for money and some of the most unique safari experiences available on the African continent. Our per-existing itineraries cater to all types of travelers. Opt to customize an existing itinerary or have your trip planned from scratch. Namibia is truly quite unlike any other country on the African continent. The combination of dramatic coastal beauty, vast desert landscapes and prolific wildlife is what makes it so exceptional. The country is so sparsely inhabited that you could spend hours on a stretch of road without encountering another soul. It is an overwhelming experience, and truly ‘away from it all’. Despite being ‘away from it all’, the country has a very decent infrastructure, which is why it is the only other country besides South Africa that we offer overland safaris to. Road tripping across the breathtaking backdrop of desert, canyons and the frosty blue of the Atlantic adds a whole different dimension to the appeal. Though you may be able to enjoy traditional safari game drives elsewhere in Southern Africa, Etosha’s striking arid landscape makes it incredibly distinctive. Many professional wildlife photographers cite Etosha as one of their favorite destinations, because of the remarkable tableaus available. Beyond Etosha, nowhere else in Southern Africa will you find desertscapes quite like the dunes dancing up and down Sossusvlei. The opportunities for adventure abound in Namibia. While game drives in Etosha and exploring Sossusvlei are certainly the most popular, driving along the bleak shores of the Skeleton Coast, with its haunted array of shipwrecks, or visiting the deserted ghost town of Kolmanskop, offer extraordinarily unique adventures. 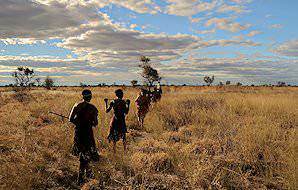 For the culturally inclined, a visit to a traditional Himba village will always prove a memorable experience. From Johannesburg or Cape Town, guests will typically take a flight of around two hours to Windhoek, Namibia’s capital city and gateway to the safari areas. For visitors wishing to circumvent Windhoek, daily flights are now also available between Johannesburg and Cape Town and Walvis Bay, a small outpost wedged between the icy waters of the Atlantic Ocean and the looming Namib Desert. Walvis Bay is less than an hour’s drive from the seaside resort town of Swakopmund, which is superior to Windhoek in terms of tourism. Namibia likes to brand itself as “one of the sunniest countries in the world”, which is not without merit – the country averages 300 days of sunshine a year. The result is a generally hot and dry climate with low humidity. It is thus quite popular to visit Namibia during the winter and early spring, roughly May to October, when the country experiences cooler temperatures. The dryness during this time forces animal to congregate around limited water sources, which makes for rather spectacular game viewing. The ‘rainy season’ does have its charm, however. It may be terribly hot, but seeing a typically arid landscapes erupt in bits of greenery is quite something. Though rare, the clay pan of Sossusvlei occasionally fills up with water during exceptionally wet periods, which is a most remarkable sight amongst the towering dunes. The coastal climate is quite harsh. Due to the cold Benguela Current along the Atlantic coast, the temperatures tend to drop strongly compared to other areas of the country. Even in the hottest months (January – March), the temperatures of the Atlantic Ocean rarely exceed 19° C. As a result, though Swakopmund may be considered among the most charming coastal towns imaginable, you will not be visiting it for a typical beach holiday. In terms of its visa regulations, Namibia is very accommodating. The majority of European countries do not require visas, nor do visitors from the United States, Australia, New Zealand, Russia, China and Japan. It is still imperative, however, that you check on either the Namibian government’s official website or contact the nearest embassy in your country to be absolutely sure. Travel regulations change on a frequent basis. If you were to require a visa for Namibia, the cost of the visa is dependent on the duration of your visit. For travel with African Sky, this will always fall within the three-month visa category, currently priced at N$390, which is, at the time of writing, under 30USD. The price for a multiple entry visa is the same. Your visa should be acquired prior to your arrival in Namibia. Malaria is prevalent in the north-eastern corner of Namibia, where the border meets northern Botswana, Zambia and Angola. The area affected is much of the inland region north of Windhoek. In terms of tourism, this includes Damaraland, Etosha National Park and the Caprivi Strip. Coastal areas like the Skeleton Coast, Swakopmund, Walvis Bay and Luderitz are malaria-free, as are southern inland destinations like Sossusvlei and the Fish River Canyon. To prevent malaria, be sure to consult your personal physician for recommended anti-malarial medication. Mosquito repellent is generally considered a safari essential. Though most upmarket lodges will provide repellent in your room, it is nevertheless a good idea to carry your own. A yellow fever vaccination is only required if you are entering Namibia from a country where there is risk of yellow fever. None of the Southern Africa countries we offer travel to currently fall under yellow fever risk, as Zambia was recently removed from the list and is now classified under ‘low potential for exposure’. Therefore, you should only concern yourself with yellow fever if your travel extends beyond our care. As is standard when traveling anywhere in the world, it is highly recommended that you are up to date with routine vaccinations like MMR, DPT, varicella and polio. By and large, crime rates are very, very low in Namibia. As is often the case, however, petty crime can (and does) occur in urban centers like Windhoek and Swakopmund, so nevertheless be discreet with your valuables. If an in-room safe is not available at the hotel or lodge which you are staying at, simply ask reception to store your valuable items for you for the duration of your stay. When enjoying a safari, avoid approaching or feeding wild animals, as once they begin to associate human beings with food (particularly monkeys and baboons), they can become quite aggressive and will need to be dealt with by park authorities - an unpleasant yet entirely avoidable scenario. The distinct experiences available in Namibia are largely desert-oriented, with elements of the harsh coast, ancient history and and the country's unique geology blended into them. This desert has far more to offer than initially meets the eye. Sandwich Harbor is a striking coastal lagoon south of Walvis Bay, within the Namib-Naukluft National Park. The immense sand dunes running straight into the ocean create a most remarkable display, and the area was declared a UNESCO World Heritage Site in 2013. The activity is tidal dependent. Twyfelfontein is the site of ancient San rock engravings in the Kunene region of north-western Namibia and another UNESCO World Heritage Site. It was used as a place of worship by the Khoikhoi and, in the process of shamanist rituals, around 2 500 rock carvings were created. 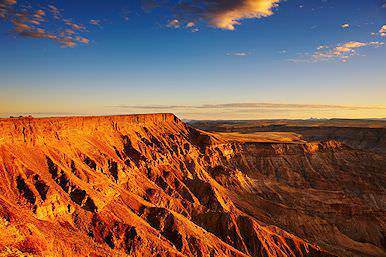 The Fish River Canyon in southern Namibia is the largest canyon on the continent. The ravine is around 160km (100 miles) in length, up to 27km wide and 550m deep. The river is the longest interior river in Namibia. Watching the sun rise over the rifts of gneiss bedrock is captivating. Due to the vast distances between destinations in Namibia, it is the ideal country for a road trip. Should you be enjoying an overland tour of Namibia with African Sky, your means of transportation will consist of an air-conditioned 4x4 vehicle to ensure your comfort and safety on those long, lonely roads. Should you wish to avoid the long distances, light aircraft charter flights are available to all Namibia’s finest lodges, from the sweeping red dunes of Sossusvlei to the wilderness of the greater Etosha National Park. Keep in mind, however, that these flights are considerably expensive, and that luggage restrictions apply. Due to German colonization from 1884, strong German influences are prevalent in the country’s cuisine. Much like the Germans, Namibians love their brötchen (bread rolls). Frankfurters, sauerkraut and beer are national staples, too. Kabeljou (cob) is a popular base for seafood dishes, as are kingklip and sole. The best locations to enjoy delicious fare from the Atlantic are coastal towns like Swakopmund (revered for its oyster pickings) and Lüderitz (crayfish / rock lobster). Namibian beef is spectacular, as the majority of cattle in the country is free-ranging. The result is deliciously flavorsome and relatively lean cuts of meat, which are best enjoyed as succulent steaks, which are widely available. With easy access to such delectable spoils as gemsbok and springbok, game meat is wildly popular in Namibia. The naturally free-range meat is standard fare at most safari lodges, and can be enjoyed as biltong, steak, goulash, kebabs or in a potjie. The roads and distances may be long and lonely, but the country's infrastructure is very good. Nevertheless, 4x4 vehicles are recommended to contend with the hardy desert terrain. Will I have mobile reception and/or access to internet? While mobile reception and internet connectivity should not be an issue in major centers like Windhoek, and to a lesser extent Swakopmund, you will have little to no access in more remote locations like Etosha and Sossusvlei. Relish your break from the interruptions of technology. Would it be too hot to visit Namibia in the summertime? Namibia may actually be considered a year-round destination. While it can be stiflingly hot in the summer, once the rains arrive in December it tends to cool a bit. Can I go on a Big Five safari in Namibia? Unfortunately, buffalo do not occur in Etosha National Park. Black rhino, lion, elephant and leopard, however, are prevalent in healthy numbers. Can I travel overland from South Africa to Namibia? Though it is possible, it is not recommended, as the distances are extreme. As you may only have a limited time available for travel in Southern Africa, opt to rather fly into Windhoek and explore from there. Which is better: a charter flight or overland transfer? While this largely depends on your budget - charter flights can be quite costly - overland trips are also a great way to see more of the country, and the transport of preference for travelers who might not be comfortable in small, light aircrafts. Does Namibia offer good value for money? Yes - as Namibian services are charged in Namibian Dollar, which shares an exchange rate with the South African Rand, you are more likely to be able to make use of a favorable exchange rate than you would be in Botswana, Zambia, Zimbabwe or Mozambique. The country's decent infrastructure and more budget-friendly accommodations add to this value. Besides Etosha, are there other areas where I can go on safari? The Caprivi area in northern Namibia also offers safari experiences. It is a wetland environment characterized by the configuration of the Chobe, Okavango, Kwando and Zambezi rivers. While a handful of lodges exist, wildlife numbers are rather low in comparison to other safari areas. How big is the Namib Desert? The Namib Desert is around 81 000 km2 in extent. The Atlantic Ocean hugs the Namibian coast, and the cold Benguela current makes for frigid waters and turbulent seas. Water-based activities nevertheless exist, like deep sea fishing and kayaking with seals. South Africa is one of the African continent's top travel destinations. Botswana vacations include a wide variety of exciting safari activities. Travel to Namibia for an unforgettably unique, desert-oriented vacation. 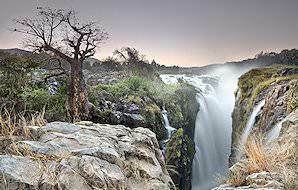 As an African travel destination, Zambia is known for Vic Falls and remote safaris. Travel to Zimbabwe for a glimpse of the awe-inspiring Victoria Falls. A Mozambique vacation will comprise crystal-clear waters and colorful coral reefs. Namibia is one of my personal favorite destinations. The country is vast, with haunting deserts, great animal concentrations and a sense of truly being away from it all. It is important to remember that the distances between different areas are vast, and that if you book a privately guided safari tour, you will be spending a fair amount of time on the road traveling between different areas. Having said this, you will definitely be rewarded with a vacation unlike anything that you've experienced. African Sky made excellent recommendations on itinerary planning with cost considerations for my primary safari objective. The tour guides, Andre in Cape Town and Kurt in Namibia, had outstanding knowledge of locations and especially animal behavior. All aspects of the itinerary were well planned and meticulously executed. 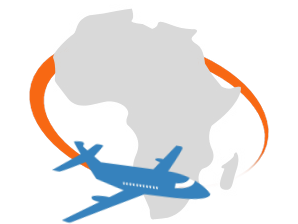 African Sky is a quality organization and have a solid thumbs up for me for anyone seeking a great vacation experience in South Africa. Despite its immense size, Namibia has the second lowest population density in the world. This is largely due to the nature of the environment – vast and arid. Great expanses of nothingness. However, the tiny population (just over 2 million) is remarkably diverse. Around half of the population consists of Ovambo, a people that also inhabit Southern Angola. Like the black Africans of South Africa, their origins can be traced to the Bantu-speaking migrants that journeyed south in early first millennium. The remaining percentages are generally evenly divided amongst the Kavango (who inhabit the wide floodplains that flank the Okavango River along the border with Angola), coloreds (with similar, though not as diverse, origins as the colored people of South Africa), the Herero (vibrant pastoralists who survived the first genocide of the 20th century under harsh German-colonial rule), the Damara (one of Namibia’s oldest ethnic groups that speak a dialect of the click-based Khoekhoegowab language of the Central Khoisan) and Namibian whites, the majority of which are Afrikaners originally from South Africa and the minority of which are Germans descended from the country’s colonizers. A much smaller percentage belongs to the Nama, a subgroup of the nomadic Khoikhoi and the most populous surviving ethnic group to speak a dialect of the Khoi’s click-based language. A small population of the San people still inhabit the easternmost reaches of northern Namibia – the last of Southern Africa’s indigenous hunter-gatherers. In addition to the main tourism highlights like Etosha, Damaraland, Swakopmund, Fish River Canyon and Sossusvlei, Namibia offers many other exciting sites of interest. 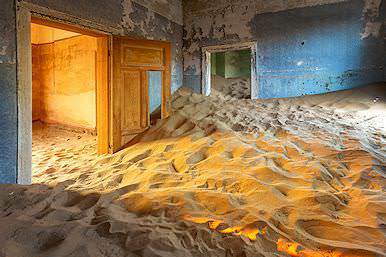 Kolmanskop, for example, rises like a ghost town out of a sea of sand near Luderitz. Once the center of the flourishing diamond-mining industry, today it is a mere shadow of a more glorious era. Abandoned in 1956, nature has since reclaimed most of the town and sand has swept through broken windows and open doors. It is both an eerie and fascinating visit. 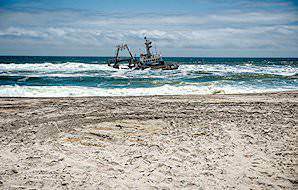 The Skeleton Coast offers a similarly ghostly experience. Countless ships have met their end along Namibia's rugged, fog-riddled coastline, blemishing its shores with a vast graveyard of wrecks. Some of the wrecks date back to the days when Portuguese explorers and the ships of the Dutch East India Company circumvented the Cape en route to India. Few remain intact, however, due to the relentless battering by the Atlantic Ocean breakers and sand-blasting by the prevailing southwest wind. Namibia's topography is defined by a narrow coastal plain and a broad inland plateau that are separated by a rugged escarpment. The coastal plain extends eastwards from the coast for between 80km (50 miles) and 120km (74.5 miles) to the escarpment. With an average rainfall of between about 10mm (0.4 inches) a year at the coast and 150mm (6 inches) in the stretch along the eastern edge of the desert, this is an extremely arid tract of land. The escarpment forms part of the Great Escarpment of southern Africa, which extends from southern Angola towards the Drakensberg in South Africa. In Namibia, it is characterized by a deeply eroded mountain chain running brokenly from the Kunene River in the north to the Orange River in the south. The central highlands, a landscape of dissected rolling hills, are known as the Khomas Hochland. East of the escarpment lies the inland plateau, an area of vast plains fringed by low mountains, scattered hills and 'inselbergen' (island mountains). Further east, the landscape is dominated by the low, rolling Kalahari dunes. The Caprivi, in the far northeast of the country, is a region of rivers, narrow water channels and woodlands unlike any other part of Namibia. Spitzkoppe are a group of granite hills that rise dramatically from the floor of the Namib Desert between the Namibian towns of Swakopmund and Usakos. The highest of these hills is 1784m above sea level. Many fine examples of bushman artwork can be seen in the region. It is also popular amongst hikers intent on conquering the hills and photographers keen on capturing stunning images of various rock formations. A ghost town reclaimed by the desert after a brief heyday in the early 20th century, Kolmanskop is Namibia's most famous ghost town. It is located a few kilometers inland from the port town of Luderitz in southwestern Namibia. Born out of a diamond rush in 1908, the town started to decline after World War I when diamond prices hit rock bottom. Forty years after it had been born, the town simply died and was reclaimed by the harsh desert that surrounds it. 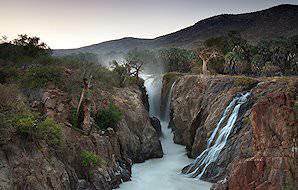 Epupa falls occur in the Kunene River in the Kaokoland region of Namibia. The name is a Herero word which means "the mist created by falling water". The main attractions here are hiking trails and the scenery created by baobab trees and falling water. It is possible to swim in some of the pools at Epupa. Those who wish to try should just be mindful of crocodiles. The Welwitschia plains lie between the Swakopmund River in the south and the Khan River in the north. They form part of the arid plains of the Namib Desert and are home to the largest concentration of Welwitschia plants in Namibia. Some of the larger examples are 2 000 years old. The name Cape Cross had its origins in 1486 when the Portuguese sea farer Diego Cao planted a stone pillar here toped by a cross, to stake his country's claim to the territory. The reserve which surrounds the cross planted by Cao is today home to the largest colony of Cape fur seals on the planet. During November and December, the size of the colony can swell to include 210 000 individuals. Dias Point marks the spot in the southern Namibian port town of Luderitz where the Portuguese seafarer Bartolomeu Dias erected a padrao on 25 July 1488. The original has been destroyed, parts of which ended up in the Cape Maritime Museum. A replica was unveiled on the original spot on the 25th of July 1988 to commemorate the 500th anniversary of the Dias landing. Dune 7 is located about 7km east of the Walvis Bay. It is the highest dune in Namibia and is the focal point of a number of adventure activities that include dune boarding, quad biking as well hiking trips dedicated to conquering this mountain of sand. Namibia's petrified forest is located about 50km west of Khorixas, about an hour and a half south of the Etosha National Park. The "forest' consists of a number of enormous fossilized tree trunks, estimated to be around 280 million years old. Scientists established that the trees did not grow in Namibia, but were washed down a river in ancient times. Sandwich Harbor is a coastal lagoon situated some 55km south of Walvis Bay in the Namib-Naukluft National Park. The area is named for a ship called 'The Sandwich', which anchored here around 1790. The area is part of the Namib Sand Sea, with dunes that can be as high as 100m. No roads exist to this attraction - existing sand tracts change and disappear as a result of the onslaught of tides and wind on the coastline. Brandberg Mountain is locate in the Namib Desert in the Damaraland area of northwestern Namibia. The name "Brandberg" is an Afrikaans name meaning 'burning mountain'. This name was given to the mountain because the setting sun illuminates it and gives it the appearance of glowing a reddish color from a distance. Ballooning over the great wilderness areas of Namibia is an experience not soon to be forgotten. The excursion typically starts pre-dawn with the opportunity to witness a sunrise over this ancient land, from a unique vantage point. The flight itself lasts about an hour and is normally followed by a champagne breakfast at a remote location. The duration of the entire excursion is normally around three and a half hours. Namibia's sea of sand offers a few unique adventures ranging from hiking in the dunes to sand boarding, an activity which is not recommended for the faint-hearted, but that is sure to appeal to adventure-seekers. Exploring the desert on a quad bike is another one of the activities that can be enjoyed in this corner of the world. If you are staying at a lodge or camp in one of wilderness areas of Namibia, daily game drives will be the mainstay of the activities enjoyed on your Namibian vacation. The possibility of some unique sightings like the rare desert black rhino and black-faced impala is sure to add a degree of excitement and anticipation to your game drives. The various lodges found in Namibia generally offer a variety of spa treatments. These treatments that range from massages to facials, manicures and pedicures are offered either at a dedicated spa at the lodge or within the privacy of your suite's private deck, overlooking scenic landscapes. The waters of the Namibian coast are some of the richest fishing grounds in the world. Those intent on fishing the coastal waters are best served booking a charter out of either Walvis Bay, Swakopmund or Henties Bay. The rivers in the norther part of Namibia offer exceptional fresh water fishing, with the legendary tiger fighting fish providing an especially popular pursuit. A variety of short cruise excursions are available from both Swakopmund as well as Walvis Bay. These range from cruises dedicated to viewing the rich marine life of Namibia in close proximity, whether it be dolphins, whales or seals. A few leisurely sunset cruises are also available to those wishing to view a sunset over the Atlantic. The number of documented bird species spotted in Namibia number approximately 650. What makes birding in Namibia special is the incredibly diverse habitats where these species can be spotted, from the desert coastline and unique attractions like Sandwich Harbor to the waterholes of Etosha, where a great diversity of bird species congregate during the dry winter months. Do not be fooled by Etosha's seemingly desolate landscape. This extraordinary national park supports a wealth of wildlife. Namibia's breathtaking Sossusvlei region is one of the continent's most unique travel and vacation destinations. Namibia's historic capital city serves as the gateway to the country's top travel destination and offers a pleasant overnight stay. 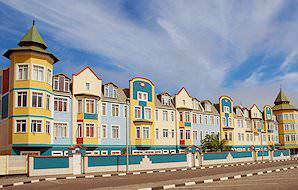 Swakopmund is a charming seaside resort town located where the sands of the Namib meet the shores of the Atlantic.